RKNA Merit Awards › Rottweiler Klub of North America Inc. The RKNA Merit Award Program is an honor award for RKNA members’ dogs. Dog owners must be members in good standing with the RKNA when applying for the award. The dog must have an RKNA Ztp, an AD, and three V ratings from RNKA Sanctioned Shows under two different judges. One V rating must be obtained at the RKNA Spring Sieger Show or the RKNA Klub Sieger Show. Males must have an IPO 3 with pronounced rating with a minimum score of 270. Females must have an IPO 1 with pronounced rating with a minimum score of 270. The dog must have an RKNA Ztp, a V rating from an RKNA Sanctioned Show, and an IPO title. The dog must have an RKNA Ztp and a V rating from an RKNA Sanctioned Show. 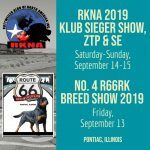 Another Great Event RKNA Inc. Klub Sieger, Breed Show. ZTP, SE and ADRK BSE offered. Two Judges to be announced. Rottweiler Klub of North America Inc. © 2019. All Rights Reserved.